Dear readers, on August 2, 2017 the Ministry of Exterior Relations released (full text here) broad changes/reclassifications to the Colombian visa program. All in all, we perceive the changes as positive and most of the changes are designed to clarify and simplify not complicate. Mariana and I have gone through the 21 page article/resolution in great detail and it is with pleasure that we summarize what we think are the most important changes/updates for Medellin Living readers. As always, never hesitate to send us an email or visit us in our offices if you have any doubt about your immigration status in Colombia. Note: many of the requirements for each of these visas are exactly the same as before, they have now just categorized many of the old “TP” visa types into the V and M types respectively. 2) Visitor visas – not much changed here; there is a new type of “working-holiday” visa and cultural interchange/study visas with up to 2 year validity, but overall the same max 180 day rule applies to visitors in Colombia for most work and leisure/tourism purposes. 3) Migrant visas – obtained via marriage, investment (via SAS or real property), new business formation, and certified pension income. ALL “M” visas are now granted with a 3 year duration (big news! ), where previously the durations ranged from 1 to 3 years. This is very positive in my view as it cuts down on the annual paperwork/trip to Bogota for these types of visa holders. 4) Resident visas – no real change and exactly the same application requirements as always (usually obtained via real estate investment of 650 minimum salaries, or about $475MM COP). A clarification that if the “R” visa holder should posses his/her cedula de extranjeria and should not be absent from Colombia for more than a 2 year continuous period. 5) Student visas – in general, Cancilleria seems to be tightening up on student visas. Specifically, only granting the visa for the term of the studies and NOT for the standard 3 year term, and also requiring bank account statements in the name of the applicant showing sufficient funds for their visa period. 7) Pension visas – no change, just certify about $750 USD/month in pension income to apply. 8) Marriage visas – the Colombian person you are marrying must present a written and notarized letter authorizing you to seek the marriage visa. This is most definitely due to abuse and “arranged” types of marriages to random Colombian nationals/”friends”. 9) Interviews – there is a specific mention of the use of interviews at the leisure of the Cancilleria when it is deemed necessary to validate any information in person about the foreigner’s activities in Colombia. We have definitely seen the number of interview requests increase and can help prepare for them. 10) Bank account verification – for many applications, a specific statement that bank account statements could be requested to validate sufficient financial resources to support oneself in Colombia. This might sound strange coming from a developing country but my hypothesis is that it is probably targeted at Venezuelan immigration attempts more than anything. 11) While not explicitly called out in this latest article/update, we have also seen an uptick in the amount of information (and interviews) being requested for holders of “business/start-up” visas to ensure that their companies are actually being used to conduct business in Colombia and not just for the purpose of obtaining a visa. We have assisted recently a number of new clients who had previously had issues in order to get their books in order and properly presented. Once again, we think the changes are all good. The high quality visa applications are being rewarded with longer renewal terms and the lower quality types or those subject to abuse are now subject to more documentation. If I or my partner and immigration specialist Mariana Goez (mariana.goez@casacol.co) can be of any assistance feel free to drop us a line or schedule a meeting with me directly (juanjose@casacol.co) to discuss further. 3) Resident visas – no real change and exactly the same application requirements as always (usually obtained via real estate investment of 650 minimum salaries, or about $475MM COP). A clarification that if the “R” visa holder should posses his/her cedula de extranjeria and should not be absent from Colombia for more than a 2 year continuous period. The Colombian government quantifies many financial requirements in terms of multiples of the minimum monthly Colombian salary. That minimum, which is usually increased at the beginning of each year, currently stands at 737,717 COP. Thus, the requirement of 650 minimum salaries mentioned in the article comes to about 475 million COP. I have a resident visa. Is it easy to renew the resident visa at the end of the five year term? What are the requirements for renewing the visa? Hey Steve. I just switched my TP10 Visa to a resident Visa last month. The process was pretty easy. I needed the letter from my wife, the migration movement certificate (you get this at migracion colombia), copies of my passport info, last entry stamp into Colombia, and of course, the payment. The paperwork is done online, and the forms must be filled out prior to coming into the office for your Visa. Just go to the Cancilleria website and fill out the information. Also, at the end of the application, you have to upload your documents and a photo for your Visa. Supposedly, you don’t have to bring documents to the interview (as you uploaded them online already). However, I was asked to provide the physical copies during the appointment with the official. I brought all the copies, so I didn’t have any issues. The online process is supposed to make the process easier, but in reality, it made it more convoluted. What’s the point of requiring you to fill out your application online and uploading your passport photos, etc if you have to bring all that stuff to the interview anyhow? Also, get there early. The office is swamped with Venezuelas looking for a Colombian Visa. When I did my TP 10 Visa 3 years ago, I arrived 30 min early and was about the 2nd person in line. Last month I arrived about 30 min early, and found myself at the end of a line that was already about 40 deep. Yes, you do have to go to Bogota for the Visa. However, unless your TP10 is about to expire, then I wouldn’t go through the hassle of changing Visas. Also, you need to have had your TP10 for at least 3 years in order to be eligible for the resident Visa. This post is so weak and full of ads. You missed a key thing that these new visa regulations aren’t effective until November – three months from now. So we still have all the TP visas until then. The requirements that are for now are still good counting 90 days after August 2 when this reform was published. I would not call that the post is weak but I do respect your comment. Thanks for reading. The news about the 3 year M visa is great! I wonder if this applies for the TP-7 Rentista visa as well. It would be nice not having to show my income each year to the Colombian government since the monthly income requirements are quite high. I was told the requirements right now are around $3820 USD monthly. Hello Louis, that is the main change in this new requirements. That the visas will have longer expiration dates according to the category. Waitta minute! Louis isn’t actually referring to the TP7 visa, is he. That’s the Pension Visa, isn’t it? And it certainly isn’t $3,000+ bucks. 3 years is not a guarantee for M VISAS: Times authorized for visas: Everyone needs to be clear. The law says they can issue 3 years for a M visa but the officials will grant the 3 years as they wish. If their new operating manuals tell them to issue 1 to 3 you will see fluctuations between the visas. Just because you can get up to 3 years does not mean they will issue it. The officials will have the capability to issue 3 years, but for visas like the business owner visa you will probably see M visas issued at 1 year only as new business owners will have to prove they are actually functioning as they should. For example they are going to crack down on business owner visas, so it would make more sense that these visas are just given out for 1 year until the officials believe that the business setup is not a negocio de papel, aka paper company/shell company. The NE4 visa under the current system is a perfect example. It can be issued for many years, however its common to issue for 1 year. You will probably see pension visas with life time benefits issued with longer duration, up to 3 years. What has not been published and is not public are the operating procedures which MIGRACION COLOMBIA WILL USE. Plan on mass confusion with immigration officials during implementation. Immigration officials have not even been trained yet. SO, they will implement changes last minute and officials will be just as confused as immigration officials. Overall we have some good changes, and some types of visas will be tightened up. I have had clients that got the TP10 after the common law marriage. “common law marriage”… that’s the ‘living together situation, right? Make sure to read the comments below those articles for additional/updated information. I have been trying deal with Juan and company. I sent numerous emails. The last email sent to Juan I had attached my birth certificate and the legal notarized document asking if this what I need and then silence…no reply back. I was going to procure their services to do this for me. Makes me wonder if they can help. I just responded to your email. I was away from the office with very poor reception. Please confirm that you did send me the documents requested because on both emails there is nothing attached. Thanks …you have received my attachments and I appreciate that you are taking them to your notary to see if they are okay. Does Immigration cross reference tax information with DIAN? Will they deny visa renewals if there are delinquent taxes or filing requirements? There is not an active cross reference between the 2 government entities unless one specifically asks the other. The DIAN may have an issue with a foreigner and notify Migración or DIAN could request number of days in country over a 365 day period to determine a foreigner’s need to file. But there is not an automatic integration between the systems in my experience. I have a resident visa, can I renew the visa at the end of the 5 year term? What art the requirements for renewing a resident visa? When I went to renew my TP7 around December of 2016 it turned out to be very complicated to deal with the DAS in Barranquilla where I lived at the time (I’m in Medellin now). Somebody (not an attorney) helped me with the Cancilleria site (I realize now I probably could have done it myself) and the end result after paying late fines was that I did get the renewed TP7 in my passport but I did not get a cedula. Instead, I got some run around that they just took more time, then I was told I had to go to Bogota to do it OR one of their guys (at DAS) would take my passport would do it for me for 300K COP. I declined… still with an expectation that I would be able to get it done somehow in or from Barranquilla. I never did. So now I have a valid TP7 in my passport but am carrying an expired cedula. What’s the best way to clean up that disparity now? My visa renews in mid January 2018. I need the cedula for benefits e.g. getting a Claro or Tigo plan and/or phone. I have a couple of comments on this. remember that DAS does not exist anymore in Colombia, where you went in Medellín was the Migration office. Regarding your TP7 Visa, you had up to 15 days once you Visa got stamped on your passport to register in the “Registro de Extranjeros” and get the cédula. If you exceed this time you would incur into a fine in order to get your visa, the longest it passes the bigger the fine could be. What? I’m on a TP-10 visa with my Colombian wife and now I can’t work legally? This is ridiculous. What am I meant to do to earn money? I’ve just checked the orignal document you linked too, and I believe you made a mistake about the M marriage/spousal visas. More interestingly the R section says people with an M type visa (most TP visas) can now apply for residency after 2 years. 3. Ha permanecido en el territorio nacional de forma continua e ininterrumpida por dos (2) años como titular principal de visa tipo “M” en las condiciones de los numerales 1 al 3 del artículo 17. My Spanish is less than perfect, can any one else confirm this interpretation? Hello Richard, thanks for taking the time to read and make this comment. Regarding your comment, it is not actually a mistake. Let me make a clarification in this matter. Chapter 2, article 20 indeed allows the person that holds an M visa, from numerals 1-4 which apply to the case referred ( spouse) you can openly work in any legal activity in Colombia, now, what I wrote was that the dependent people are not allowed to work. “Titular en calidad principal: Calidad de titular de visa que indica independencia en relación con otros titulares de visa. Al Titular Principal se le otorga visa de forma autónoma. Titular en calidad de beneficiario: Calidad de titular de visa que indica dependencia y parentesco o vínculo marital con un titular principal. Al Titular Beneficiario se le otorga visa como miembro de grupo familiar.” giving us the definition on who holds a visa independently and who doesn´t. Chapter 4 of this new legislation, will defined who can hold a beneficiary visa, ( dependant ) nd its rticle 28 establish how this person can not work. This is what I was referring to. If by any chance this created a big confusion, my apologies, and I really do appreciate constructive messages/comments like yours. So what makes someone a spouse and what makes them a dependent? If I marry a Colombian, will I be allowed to work? If you have a TP-10 visa, are you required to pay taxes in Colombia? The section on obtaining residency after two years with M visa imposes the conditions that the principal visa holder live continuously (without interruption) in Colombia .. and that all is in accordance with the regulation cited, according to my reading of the Spanish you conveyed. If you hold a T-4 working visa for 2 years, you can apply for residency? you to choose any one of a number of Colombia cities where you can pick up the cédula a few days later. Often, as I found in Popayán recently, there is someone in the Migración office who speaks plausible English. Confirm verbally the cédula pickup city if it is different from the city of visa application. If you still get the Migración runaround and you must get your cédula-based benefits (or if you can’t wait for the cédula until visa-renewal), contact a visa facilitator or attorney who speaks your language. Does anyone know for SURE what date the new Colombian visa types and regulations go into effect? I’ve been googling extensively on this topic since my current TP-7 visa expires on Nov 4 but I’m lusting after having 3 years instead of only 1. I’m uncertain whether or not to trust the new effective date for the new rules that I’ve seen posted. I’ve seen both Nov 1 and Nov 2 on some sites, but mostly just on blogs and news type websites. On some more legal / immigration type sites I’ve seen the effective date as Dec 14! Those say that the effective date is 90 business days after initial resolution/publication. Since Resolution 6045 was published on Aug 2, then Dec 14 is spot on (after subtracting the numerous Colombian holidays). Perhaps the web sites stating Nov 1 or 2 were just thinking 90 calendar days? Or maybe just they just added 3 months to the Aug 2 date? According to Cancilleria, the first day of the new regime will be Dec 15th. Too bad for me… Hopefully this is good news for you. Thanks for providing this information. I currently have a TP4 visa, but have been out of Colombia for the past 6 months. Would you envisage any issues arising if I was to return back to Colombia before the visa expires? Mainly in that for some of this period I have not been working (partly due to health issues). The company that sponsors the visa don’t have any problems with me having the visa though. Hello Andrew, coming back to Colombia would not have any issue. I would need further information in order to give you better advising. How long did you get the visa for? when does it expire? All the visas given by the Colombian government has certain requirements to not get canceled, one of them is nit to stay out of the country continuously or discontinuously for a certain amount of time in a rolling year. Please contact me if you would like me to review your migration status. Do you know that if I apply for my work visa next week, will I have to get a new one when the changes come in? 1. I am considering a migrant independent activity visa and have everything but the “título profesional debidamente convalidado ante el Ministerio de Educación.” I have researched the process of verifying the diploma and the process takes 2-4 months. Unfortunately, I don’t have the apostiles yet and I only have three weeks before I need to renew my visa. Do you know of any other ways to certify the diploma and/or do you think it is required or a suggestion depending on who is reviewing the application. 2. If I apply for an independent activity visa, but get denied (because of the above reason), is there a time frame I need to wait before applying for another visa? Or can I immediately apply (I understand I may have to pay for another study) for a contracted position visa? 1. Guessing that you are coming from the United States since both countries ( Colombia-USA) are signatory countries in Hague Convention ( Apostille convention) there is a need to have an official document that is being used in the other signatory country to have the official apostille in order to be valid. 2. Nick, if the visa gets rejected there is a period of 6 months before you can apply for another visa. Yes, the first payment due to the Ministry of foreign affairs is the application fee ( study of documentation ). Hi, I need to renew my TP-7 Imdependent Activities Visa but cannot find the list of required documents , someone told me it is the same as the first time I applied, please let me know where to find the list of required documents and I understand the minimum balance has to be in the bank of 4000 USD not the amount going in just the balance must not be below that, is this correct? 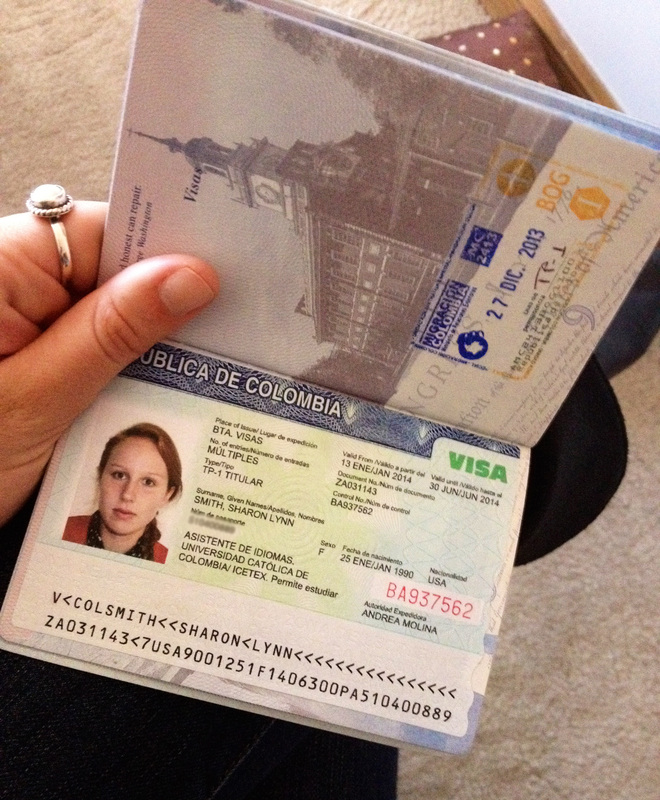 Hi there I have had a TP-6 volunteer visa for the past two years which is due to expire – I am not clear what the requirements are now – and whether I have to go to Bogotá! Can you help? CAN i OBTAIN A vISA WITH THIS? Just wanted to let you know your personal information and passport number are visible. You blurred it out on the upper part, but it is still visible on the bottom portion. Thanks for the info. Can i now enter with a 180 day return flight ticket? Ie is the 180 days issued at the immigration when I arrive or is the renewal process still applicable? I have a TP7 Independent activities Visa due to expire but trying to renew is confusing as it asks for a Degree Certificate which does not exist for what I am doing Sales. Can I use the same documents as before and letter all dated from last year? It also does not like my upload photo exact same as I used last time ? Here’s the latest info (April 2018) for anyone extending their tourist visa or permission. Migración in Belen opens at 8am. Get there as early as you can. Don’t make an appointment, because the website doesn’t work and it doesn’t matter anyway. Don’t try to renew via their website either, because that doesn’t work either. You have to just go in a few days before the expiration of your visa. Bring your return ticket info and your bank statement. You can make a copy of your passport as well to be safe, but I could see them making copies there whenever necessary, so you don’t really need it. Do bring your credit card so you can pay the 96,000 COP fee. If it’s your first time there, they’ll probably take your picture. If you’ve been there before and are in the system, they won’t do it again. That’s all there is to it. The key takeaway here is DO NOT USE THEIR WEBSITE for anything. Also, the office is air-conditioned and cold so wear long sleeves if you want to be comfortable. Where does this leave me? Do I need to apply for the new version of the TP-10 again?? 2 years ago i think it was 360 monthly salaries which is about 280 million pesos, with this i bought an apartment valued at 300 million pesos. All good, I have had 2 consecutive Visas approved June to July 2016 & June to July 2017. I’m now about to reapply for my 3rd visa. Which Visa catagory now replaces the TP7 old Visa ?????? If it’s the new ‘R’ classification which now requires 650 monthly salaries this means i need to spend another 150 million on something Real Estate to meet there requirements !!! Or is it another Classification ?? How stupid if i need to spend more money when i have satisfied there requirements for 2 Consecutive TP7 Visas !!! I just applied for Colombian Visa and they gave me this type: v titular principal. can anyone tell me what its mean.? I am traveling there for holiday, is this type of visa is good for me..? also what are the documents exactly that they must be legalized ? like what ? I am married to a colombian and I am Australian. I lived in Medellin for 1 year from August 2016- August 2017 as my husband was waiting for his visa for Australia. In this time I had to apply for a TP-10 TITULAR visa which was valid from 21st november 2016 until 21st of November 2019, we left colombia in August 2017 and have been living back in Australia since then, we have just booked a holiday to Medellin in May for 1 month. Will this visa still be valid for me to travel on? Do they need a validity of more than 6 months ? Is this visa still valid that I have left colombia and no longer living there? Will I encounter any trouble coming back for a holiday in May knowing my visa expires in november 2019 or this does not matter? Hello i have a question you might be able to answer. We worked at a school here and they sponsored our 3 year Visa. We both quit mid year last year so last July. However our cedula are good until next December 2019. Do you know what our legal status is? We just had our son here who is colombia now. We are leaving the country in June for a wedding but are nervous to visit the immigration to arrange his paper work. Can you offer any insight? I have a work visa type M.
If I apply for beneficiary visas for the kids, what category will they be? When I entered my son´s details and mine on the online application it came up with M – trabajador. Is that correct, because I (the worker) am the Titular Principal? Or did I do something wrong? The type for them will be Beneficiary Visas. (BE).